The scenic drive begins in Hanksville at the intersection of UT-24 and UT-95. You can reach this by I-70 by taking exit 149. The road trip then heads through the desert on UT-95 with the snow-capped Henry Mountains looming in the distance. Before departing from Hanksville, consider a side trip to the Capitol Reef National Park (H5), established in part to protect its most unique geologic feature, the Waterpocket Fold, a 100-mile long buckle in the earth’s surface. Formed between 50 and 70 million years ago when an ancient buried fault was moved, overlying rocks layers were draped above the fault and formed a monocline. Canyons, rock domes and architectural formations create an unbelievably beautiful surreal landscape. See the many petroglyphs depicting the life of the Fremont Indians in this area, and the Hickman Natural Bridge, a sandstone bridge spanning 133-feet. Before leaving the park, pick up some apples, apricots, cherries, peaches, and pears from the orchards for a nominal fee. The fruit was originally grown by the community of Fruita before they left the area. An exciting way to explore this park is with the Cathedral Valley Road (T1), a dirt road where you can enjoy the canyons and monolithic rocks spread across the desert. On the way through the valley, take advantage of the pullouts and many short hikes near the overlooks. At the end of the 60-mile road, you will be in Fremont Junction. Heading south on UT-95 for 10-miles you arrive at Bull Creek Pass Road, which if you have a 4-wheel drive vehicle, is another interesting sidetrip to Bull Creek Pass and Lonesome Beaver Campground. Near the Lonesome Beaver Campground, the Mount Ellen Trail (H1) is a 4-mile hike to the 11,522-foot summit of Mount Ellen, the last mountain range to be explored and named within the continental United States. While the range is well known for its herds of bison, they are rarely seen. The surrounding views of the deserts, canyons and valleys are awe-inspiring. As you descend, stop at the Little Egypt Geologic Site (A1) where natural formations of weathered and unusually shaped sandstone rocks called hoodoo create a labyrinth and sphinx-like creatures. Back on UT-95, head through the red walls of North Wash Canyon arriving at Hog Springs (H4) created by a stream which flows over a short waterfall into a clear pool. Accessible by a one mile hike, Hog Spring is a welcome respite amidst the desert landscape. Bring your bathing suit. A short hike from here brings you to Native American petroglyphs. Shortly after, you enter the Glen Canyon National Recreation Area and in 3-miles, you arrive at the Lake Powell Overlook (V1). The elegant Lake Powell below is actually part of the Colorado River created when the Glen Canyon Dam was built in 1956 and is very popular for boating and other water activities. The Dam is open for tours. In 63 miles, the Natural Bridges National Monument (H2) is on your left. The Monument is home to three sandstone natural bridges which were formed when meandering streams slowly cut through the canyon walls. Along the driving loop, you will encounter Sipapu, the second largest natural bridge in the world, Kachina, the youngest, and Owachomo, the oldest all named in honor of the Native Americans that made this area their home. Trails from these bridges will bring you to the canyon’s floor. For information, the Natural Bridges National Monument Visitor Center (I1) is just a little further east on UT-95. As you continue, keep an eye open for UT-261 where you can take a sidetrip on the dirt Moki Dugway Scenic Backway. The route is amazing, yet a little nerve wrenching as you travel the non-guardrail path down the switchbacks. Towards the middle of the drive, you reach Goosenecks State Park where the San Juan River snakes through like a Goose’s neck. Note that there is no drinking water available here so come prepared. If you have gone down this route, it’s unlikely you want to retrace back to UT-95, but heading east on US-163 will bring you to US-191, where a trip north will arrives in Blanding. In 10-miles, stop at the Mule Canyon Rest Area (H3) where an abandoned 13th century Anasazi settlement is visible. The Rest Area has a lot of information about hikes to explore Mule Canyon, including a 1-mile hike to Cave Towers. As you continue east, the drive heads through Comb Ridge, where a fold in the Earth stretches south into Arizona. This fold impeded early settlers into the area. Shortly after, stop at the Butler Wash Rest Area (H8) where a 1-mile hike will bring you to an ancient Anasazi settlement and an amazing overlook of the canyon below. The scenic drive comes to an end when you reach the end of UT-95. 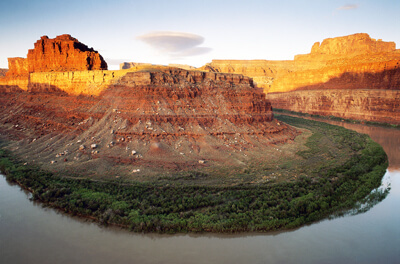 From there, we recommend that you head north on US-191 to Blanding, where you can visit Edge of the Cedars State Park (M1) home to six 13th century Anasazi buildings and a museum featuring the largest collection of Ancestral Puebloan pottery in the area and on your way back to I-70, stop at Canyonlands National Park (H6), the largest National Park in Utah, and Arches National Park (H7).